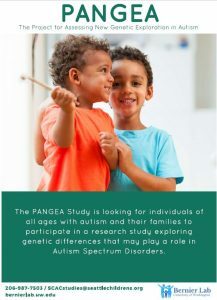 The PANGEA study is looking for individuals of all ages and their families who have been diagnosed with Autism Spectrum Disorder to participate in a research study exploring genetic differences that may play a role in ASD. 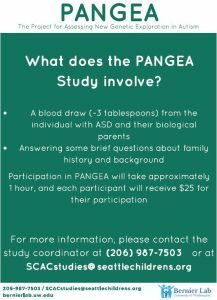 The study involves collecting blood and/or saliva samples from individual with ASD and both biological parents, if possible, and answering some brief questions about background and family history. Participation will take approximately 30 minutes, and can be completed remotely or on-site at the University of Washington or Seattle Children’s Autism Center. For more information contact rablab@uw.edu or 206-616-2889.